Rebecca Perkins is the owner of Perky Athletics, an app and website where fitness freelance instructors post their available Toronto classes. Once published, classes show on one consolidated schedule for people to easily find and secure their spot. Identifying that freelance fitness classes are held everywhere, founder Rebecca Perkins noticed the problem was that intrigued, prospective attendees weren’t able to find details about the classes. Where are these classes and when? How do we sign up for them? 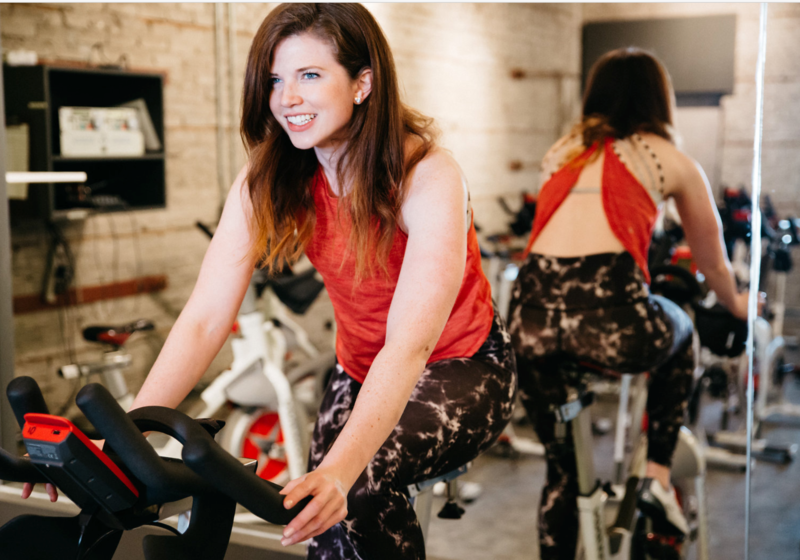 So, Rebecca developed a schedule for Toronto wellness enthusiasts, making it easy for them to find a variety of local workout classes and fitness communities. Read our full interview with Rebecca now. From where did your inspiration to create Perky Athletics stem? Well, I love group fitness classes of all types. In the summer, I always see classes underway in parks and I could never figure out how to get involved or determine if I could just show up with my mat! I realized there was this gap in the fitness industry and we needed to connect participants to freelance classes. Through Perky Athletics, fitness instructors (we call them motivators) get paid based on the revenue they generate opposed to an hourly wage. On the end of the participant, the benefit is: they participate in affordable, freelance fitness classes and can easily sign up for them online or through our app. Because the motivators are making so much more through the Perky model, the class prices are able to drop. The average cost per class is $10.00, which is quite affordable for Toronto. What makes Perky Athletics different from other online and/or digital workout outlets? There is actually no other platform right now that connects you to freelance fitness classes! We connect motivators directly to participants, with no middle person. We are not looking at studios and gyms as competitors and we have some very supportive studios that are helping Perky by offering advice and expertise. Perky is simply taking the next step, moving forwards in the fitness industry to advance the structure of freelance classes. With a name like Perky, I hope you remember it! But honestly, what we are doing is filling a gap within the fitness industry that no other platform currently fills. We are niche and are solving a problem, those are my two concerns when it comes to standing out. How long have you worked in the health and fitness industry? What about the industry appeals to you? Well, funny you ask that. I have actually worked in the Consumer Packaged Goods (CPG) industry for the past five years! Specifically, the beer industry, and I loved it. Beer and fitness go together right? Well maybe Michelob Ultra, anyways! However, on the side, I was teaching fitness classes on and off for about three years. I have officially jumped from a mix of beer and fitness to Perky Athletics full time, which has been an exciting shift for me. The fitness industry is such a supportive community, which is why I was initially attracted to it. I am so lucky to have met many wonderful motivators, each incredibly supportive of Perky and what we are trying to accomplish. When did you officially launch Perky Athletics? We officially launched on June 15, 2018. I have been working behind-the-scenes on this platform for over a year and a half, but am thrilled to finally be out in market. We had a fun summer of outdoor workout classes and we organically grew to have a schedule that mostly consisted of yoga classes in local Toronto parks. Now, we are working on transitioning into the winter season and helping freelancers find unique, interesting venues to hold their fitness classes, such as clothing stores after hours, community halls, condo gyms and more. Many freelancers already have their own space that they use, however, Perky also helps instructors connect to a space that is best suited for them. What has been the most rewarding part of your journey with Perky Athletics? The most rewarding part has been seeing motivators become their own boss and become more independent. For many freelancers who have been teaching for a while, Perky increases their number of participants and helps them earn more. For instructors who are new to freelancing, we help them create their own classes and build their network from the ground up. Through Perky, I also see how inclusive and diverse the community of participants has been. A few post class beers have been shared since we launched, really blending my two worlds! What has been the most challenging aspect? What have you learned from this experience? By far, the most challenging part of Perky was creating this company while holding a full-time job. Weekends and weeknights can only get you so far, and I felt like I was dating two people at once and both weren’t getting the attention they deserved. It was a scary jump, but once you decide to go for it, the fear turns to excitement really quickly. So now, I am in a monogamous relationship with Perky and I cannot wait to see what the future holds. My second challenge has been the tech side of the business. In the beer industry, I held a variety of sales and marketing roles, however tech is something I am unfamiliar with. I had to learn about it from the ground up. I’ve had to Google a lot of tech words along the way. How have you seen the health and fitness industry develop and change since you first started? Well, I can tell you what I predict. I foresee a shift from formal workout classes and gyms to connecting directly with freelance classes. I predict people will look for more unique fitness experiences. Since the launch of Perky, I have been immersed in the freelancer world, of course, which is a shift from the classes I had historically been teaching and participating in. Fitness studios and classes are important and will always be the backbone of the industry, but freelancing is going to continue to become more prevalent. People want options, flexible times and affordable classes. When did you first realize you wanted to found and operate your own health and fitness brand? Not until a month before I started working on the platform development! I knew that I loved teaching fitness, yet I also knew that the studio market was so saturated. I knew I always wanted to create and build a company, yet never had I dreamt of the fitness industry until the idea just came to me. This industry may not have ever been my dream, but it is now. Are you a one-person show? Or do you have a team of people to support Perky Athletics initiatives? I am a one person show with a great support team. I have some amazing motivators, friends and family who all help out with tasks whenever they can. As we expand to other cities, I am looking at finding territory managers to help develop and organize communities and relationships. We currently have one territory manager in Ottawa and have lofty expansion plans. As we’ve highlighted already, you refer to the fitness instructors that use Perky Athletics to share their programs as “motivators.” Why is this choice of language so important for your audience? Doesn’t instructor seem so formal to you? The word, “motivator,” is much more community based, and so much of instructing is also motivating. Further to that, some of our classes on Perky are more motivational than instructional, which is why I chose the word to encompass everything under our umbrella. I prefer to be motivated when I am working out instead of instructed. Would you agree? What’s the first step you take in trying to lock in a fitness professional as a Perky Athletics partner? Of course, the motivators are the backbone of our business, but at the same time, Perky is a platform for freelancers to use and facilitate. They are not my employees, nor do I determine any aspect of their classes. Think of Eventbrite, but specifically for fitness classes. That being said, motivators can upload their credentials on their profile and participants can rate and review them. If motivators go below a certain rating and if negative feedback persists, they can no longer use the app. I have not yet faced this issue, thankfully! Relationship management is a huge part of business (and personal) growth. What have you learned about Relationship management since you first opened Perky Athletics’ doors? To me, relationship management means being kind, understanding and honest. I am upfront and I try my very best to ensure all motivators and participants get what they need from Perky Athletics. Customer service is my number one priority. So far in my journey, I have established relationships that were built on these pillars. We are a community, here to help each other out! So, let’s be friendly and have a little fun. What do you hope the next few months have in store for Perky Athletics, its clientele and the Motivators involved with the initiative? Over the next few months, we are shifting into indoor spaces. As noted earlier, we are partnering with unique venues to make unique classes happen. We also have a city expansion plan to broaden beyond Toronto. You recently joined the Make Lemonade startup accelerator program. Tell us more about this opportunity and the application process. This is a fantastic opportunity. Seventy-five women-identified small business founders applied for the program through Make Lemonade, a coworking space. The 15 finalists pitched their ideas to a panel that consisted of the three program mentors and Rachel Kelly, founder of Make Lemonade. Ten companies were chosen to be a part of the program and have been provided six-months of full-time desk space as well as mentorship from three women entrepreneurs. What do you hope to gain from the accelerator program at Make Lemonade? Perky is a community, as is Make Lemonade. I am working alongside nine other companies, led by women, and we collaborate to help each other. I am really looking forward to seeing the growth in these companies throughout the next six months! How has being in a coworking space environment impacted your day to day productivity with Perky Athletics? Make Lemonade is beautiful! I think having desk space is critical to productivity, but the best part of our coworking space is the ability to throw around questions and get feedback from others who have suggestions or have been through something similar. We also have weekly meetings, where we hear the inner workings of each other’s brands. The ideas that stem from these meetings are awesome. There is nothing like walking into an office and seeing a bunch of smiling faces. Oh, and non-stop coffee keeps me constantly bright eyed and bushy tailed…or should I say Perky…all day long! When you’re not working on Perky Athletics, what other projects are you involved in? Next on my list are Perky Gives Back events, effective October 2018. This is a series of fundraising events supporting a selection of local charities. I want to ensure that while Perky continues to grow, we are also giving back to the community. Aside from this, right now, Perky is all encompassing, so I am going to live and breathe it for the next few years! What has owning and operating a brand taught you about time and stress management? When my stress level rises, my productivity declines. I know many people claim they operate better under stress, but I always wonder, are they actually making the best decisions under stress, or does work speed just increase? I am not sure. I really attempt to keep my stress levels under control so I can think clearly and make rational decisions. By nature, I am not a stressed-out person, and I realize i am lucky. If I do experience stress, there is nothing like a good run to clear my head. The greatest lesson I have acquired about time management came from my time spend in the CPG industry. It is to prioritize what is essential, weekly. Nothing is ever going to be always done, and that is something you have to accept. I will emphasize that accepting this and realizing this is okay is what I focus on. What advice do you have for other up and coming entrepreneurs? Creating Perky Athletics has not been all smooth sailing and I am not afraid to admit that. I have been faced with numerous unfamiliar situations. I found myself wanting to ask questions, but I didn’t at first because I feared I would be viewed as incompetent. My best advice is to admit what you don’t know. This is the opposite of a weakness; this is your biggest strength. “Fake it ‘til you make it,” to me, doesn’t set you up for success. You need to be aware of what you don’t know and listen to those who do know. Listen to others; learn from them. Learn from the bottom up and establish a true, strong foundation that will sustain you. When I eventually made the shift to admitting that I didn’t know everything, something remarkable happened. I became more and more comfortable with being uncomfortable. What does this translate to? It means that I wasn’t as worried about taking risks or exploring new alternatives to solutions. I knew I could listen and gain the knowledge that I needed along the way. I challenge you to give it a try! Where can our readers go to learn more about you and the Perky Athletics brand? You can check out our website, perkyathletics.com or email me directly at info@perkyathletics.com. I’d also love for you to follow us on Instagram, @perkyathletics. Rebecca Perkins. Photo courtesy of: Perky Athletics. Rebecca, thank you for sharing your story with A Quarter Young. We can’t wait to see what you do next! Readers, are you interested in signing up to be a Perky Athletics motivator? Sign up online at perkyathletics.com or download the Perky Athletics app in the App or Google Play stores. It’s as easy as creating a profile and following the step-by-step guide to follow. For A Quarter Young audiences interested in signing up as Perky Athletics participant, Rebecca has created a unique promo code just for us, granting us the gift of $10.00 CAD off the first class we take, which will likely cover most if not all of the cost! Use code UBR5N. This promo code will expire on December 31, 2018. The feature photo courtesy of Perky Athletics.